Very shallow cup and tight throat to facilitate the upper register. The 14XS is for alto players desiring a good solo sound. 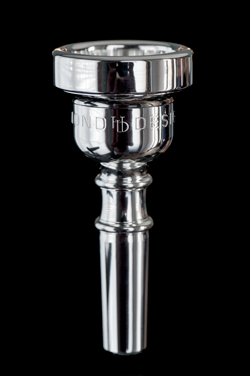 This is the standard cup within the Hammond Design trombone line. It has aspects of both conical and bowl shapes to help become the all-around choice of most players looking for a focused, yet colorful sound. .265/T3 small bore, .281/T4 large bore. 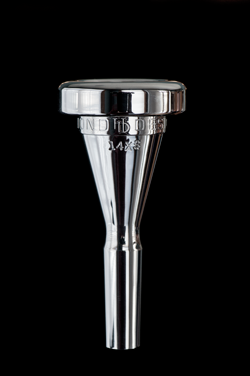 Friedman Large shank; This mouthpiece is based on a 3G type dimension, but with a medium rounded rim, more funnel shaped cup and slightly narrower throat for more focus in the upper register. Produces a large, warm modern symphonic sound, but requires a strong, focused embouchure and air stream to produce the desired center for 1st and 2nd large orchestra tenor trombone parts. Compares to Hammond 10 rim. Large stem only. Friedman small shank; Based on the large shank version, but with slightly shallower cup, same medium rounded rim and same backbore. 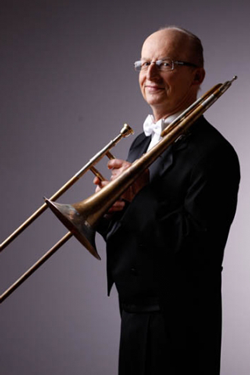 Works well with medium-bore trombones such as Bach 36, Conn 78H. Compares to Hammond 10 rim. Small stem only. Friedman Alto No. 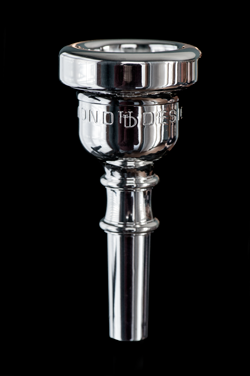 1; A brilliant sounding alto mouthpiece, great for solo playing and centering the larger bore alto trombones. This mouthpiece is excellent for pieces such as Beethoven 5, 9. Also valuable for creating a historical sound of the 19th century, with it's more alto timbre. I find myself using this mouthpiece more and more to recreate the sound of older authentic alto resonances. Friedman Alto No. 2; A slightly larger version of No. 1 with more body, slightly less brilliance. More orchestral type sound such as in the music of Mozart etc. Good mouthpiece for an alto with a narrow bore. Also good with smaller bore tenor trombones. Compares to Bach 4 / Hammond 11 rim. Small stem only. Friedman Alto No. 3: A larger sized alto mouthpiece suitable for late Romantic music, such as Brahms, Dvorak etc. This mouthpiece will blend with the tenor and bass trombone, but will still keep the classic alto sound. Can be used with medium-bore tenor trombones when extreme high register or extreme endurance is required. Compares to Bach 4 /Hammond 11 rim. Small stem only. * These charts are not based on other manufacturers' numbers, but how the piece would crossover to the corresponding Hammond Design diameter. This is based on the feel and the blowing characteristics of the mouthpiece. This is also based on years of assisting players in this very matter. A tighter backbore for a brighter sound and more resistant feel. Like the T1, only with more openness in the midsection. This creates less resistance, therefore more depth. This is the standard on the small stem M cup pieces. Same idea as the T2, just carried in farther. A dark backbore in the small stem configuration. Standard on small bore ML. This backbore is very open. Standard symphonic set-up for the ML and L cups in large bore. This is the most open, and darkest backbore. I use this backbore to balance the large bore M so as not to be too aggressive or edgy. The standard bass backbore. As you would guess, very open, but set-up to balance well with the funneled throats to aid in a consistent and focused feel.